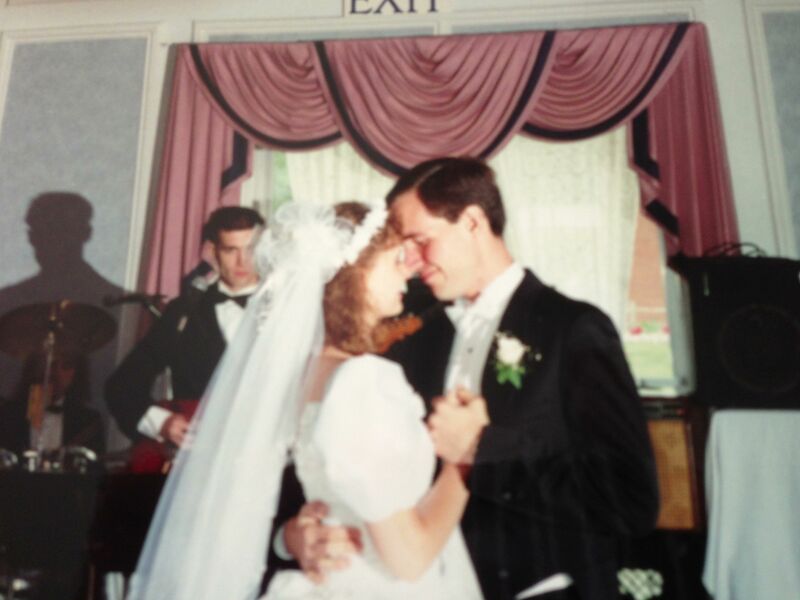 Today, August 15th, is the 22nd anniversary of one of the best days of my life – the day Lisa and I got married. To commemorate this special day, I wanted to share 22 memories. We met through a common friend who had a boyfriend at my fraternity. Lisa was brought along to parties and pretty quickly dumped off, and we would always chat (or as she says, she talked, I stood there). One party, Lisa got … um, smashed, and I had her sit down on a chair in my room – because I could close the door and find her friend so they could head home. I got back to my room and another fraternity brother was trying to put the moves on her … I mean, really? GTFO! After shooing the letch away, I actually carried Lisa down and put her into the car, a VW Rabbit, to head home. After that we chatted a couple of times, but once she left college I didn’t see her for a couple of years. We actually met one other time before this, but I was just starting to lose weight and neither was in a good place, so it was really just ‘nice’ – not enough to trigger independent contact, but enough that when the chance came up to meet again with the same mutual friend, we jumped. I will never forget the moment of Lisa coming down the stairs at Brigham & Women’s Hospital where she worked in Boston – she was gorgeous, big smile, and I was just absolutely struck. I had totally thinned out by then, and she remarked at how great I looked, and we’ve never been out of touch for more than a couple of days since! This one I have posted about before here and here, and it was so great being able to show it all to the boys last weekend, now that they are older and can better put it in context. And it is really fun to chat about it now, since the four of us are constantly connected via iMessage and we realize how much of a non-issue it would have been today. The summer of 1990 was spent with Lisa and I talking all the time, and every weekend spending hours wandering around Boston and Cambridge and Somerville talking about everything. We would go to restaurants on occasion, grab an ice cream (I was on a banana ice cream kick back then), sometimes a drink, but generally just enjoy each other’s company. We weren’t ‘dating’ at the time – which after we WERE dating caused everyone to roll their eyes because we were pretty obviously falling in love – but these moments built the foundation of our lives together. We STILL love just hanging out. – Lisa is allergic to apples, and doesn’t like grapefruit or banana … which made up about 60% of my fruit salad. Lisa’s parents and uncle came out to move her from Boston to Albany, and I brought my car as well. I stayed over the weekend to help her get set up – and frankly to get more time with her before leaving. I had been getting hints that she didn’t want a relationship, which reinforced things she had said earlier in the summer … but it turns out I misinterpreted what she said, and the ‘hints’ were really her frustration … and finally she made a move, otherwise I might have left that Sunday and we would never have been together. One thing we shared was watching Twin Peaks every week. This was an amazing and before-its-time show by David Lynch, and was loads of fun. Because it was surreal and had interesting characters and was something we shared, it was always great for conversations. And we started off talking before and after … then started talking during the whole show. Fun stuff! Thank goodness for unlimited long distance! One fun weekend we had early on when Lisa was in Albany was going to the Williams Inn (in western Mass). It was incredibly fun and romantic … and did I mention it was romantic? Um .. yeah. Anyway, in March of 1991 I was plotting to ask Lisa to marry me, I had picked a ring out at Descenza diamondsin Framingham based on stuff she liked when we looked in different stores. I talked to her parents and asked for their blessing, but then I needed to set the scene. So I booked a less expensive weekend for us at the Gregory House Inn outside of Albany. I arranged dinner, and in the car had flowers, champagne and so on. I am definitely NOT a ‘propose in a restaurant’ kind of guy, so I tried to work it so after we went back to the room after dinner I would head to the car and grab those things then come back and propose. But Lisa wanted to come with me and so on … and I was getting irritable. But eventually it happened, I grabbed my stuff and proposed, she said YES (more like ‘so THAT is why you’ve been funky all night! ), and we went on to have a fantastic rest of the weekend! – Going to see ‘A League of Their Own’ the week before. Because we lived in Mass and the Wedding was in Lake George NY, we took two weeks vacation and came up the week before. By the middle of that week we HAD to get out of the house for several hours. So we went to the movies, strolled around what is now Six Flags Great Escape, and so on. We even exchanged our gifts in the car in the parking lot. – Rehearsal dinner – one of the many things we kept in our control, was at a German family restaurant just outside of Lake George village. The owner and chef was names Ute, and she was an amazing cook and wonderful person. It was one of those things that was probably not what anyone else would have chosen, but everyone enjoyed the food and location and had a great time and it is a fantastic memory. – It was still only 50F by about noon time on our wedding day … which is pretty funny as we are experiencing very fall-like conditions now. – Many of our memories about getting ready are of how little was actually about US. Sure, I can get ready in 15 minues total, but there was all kinds of other drama going on. As for Lisa, she had her plan laid out, but never fully got to execute it … oh well, by the time we were together on the alter none of it mattered. – We missed too much of our reception when we went to get changed into our party/going away clothes and had to deal with the people who sabotaged our room . Funny … not. – After the party finished, we took a horse and carriage ride around the village … after all of the rushing and noise and so on, it was a wonderful and magical moment together. 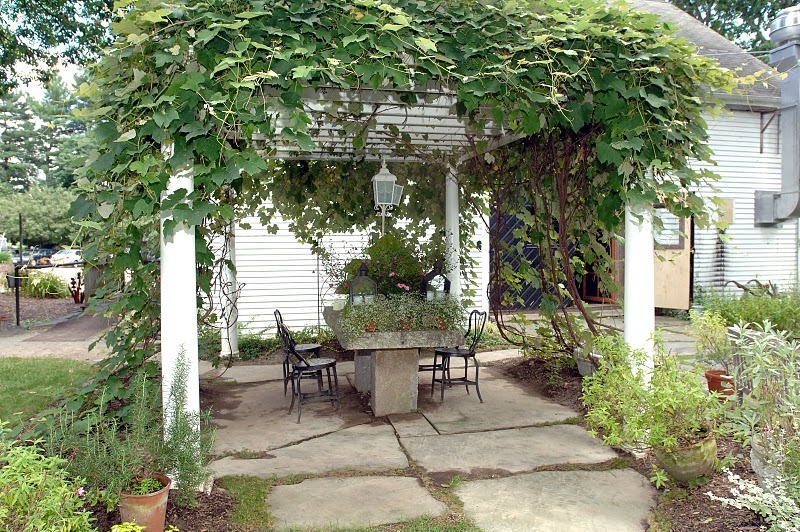 For our 6-month anniversary we found another Inn – this one in Brunswick Maine. It would allow us to go shopping in Freeport, at the Kittery outlets, and wasn’t too long of a ride from home. Since our anniversary was the same weekend as Valentine’s Day, we were able to get a ‘romance package’ – in a room with a jacuzzi, bottle of champagne, and just an incredible weekend. We would go back a couple of more times, had loads of fun each time. We also tried going there for New Year’s Eve once … well, that wasn’t quite as thrilling. During the early parts of our marriage, we did more than a few camping trips, and it was a great way to spend extra time down on Cape Cod without spending a ton of money. Plus, we could bring the Coleman stove, make coffee and eggs in the morning. Every time we went – either to Nickerson State Park or to Sweetwater Forest – we had fun. Our early vacations were around our anniversary, so we got dressed up in the tent before going out for a fancy dinner! I had so many memories of Cape Cod from growing up – so we would go to Dennis, cruise Route 6A through Brewster, and of course go to the Dairy Queen at the Orleans rotary! In my mind, it was a magical place – in reality it was at a rotary, meaning too much traffic speeding by and leading it to be noisy and smelly and dirty. But it never stopped us from going back – or stopped Lisa from making jokes at my expense. – We had more miscarriages, including the one furthest along, and struggled to get pregnant. That Christmas was very melancholy, and even though we were with others we were very much alone – but together. We also got our cat T.J. from the shelter, and got our traditional Lenox ornament as a cat and called it ‘the year of the cat’. Not being able to get pregnant easily, and having multiple miscarriages is a very difficult thing, and especially when friends around us were saying things like ‘we’re thinking a fall pregnancy’ and BAM it happened. Also, everyone in our family had their first child within a year of marriage, so they really didn’t understand. In fact ‘not understanding’ described many of the interactions we had around that time – so we sought out a support group on the advice of our OB. There was a great local one starting up (OK, it was 45 minutes away in Framingham) facilitated by a therapist, so we joined. For many months that group of several couples was a great weekly sounding board. We shares struggles, joys, advice on dealing with others, and so on. I cannot stress enough the foundation that group provided for us during that time. Then we got pregnant – and although it was what EVERYONE there wanted … we discovered that because it happened to someone else, they had a hard time being happy. As it ended up three of the five couples got pregnant within 6 months of each other, with the youngest and oldest couples not having success and terminatng contact with each couple that got pregnant. One couple in specific was quite spiteful and said some hurtful thing … which was sad after our shared experiences. As we came out of that group something was driven home – having the external support was nice in some ways, but ultimate it is Lisa and I against the world. As we entered 1996 we were ready for fertility treatments, as we were having a hard time getting pregnant (and no luck keeping them). We were going to our OB/GYN, and Lisa thought she was pregnant, and I was afraid to accept it … but she was. The expectation was that we would lose it again … but we didn’t. Then we saw the heartbeat … and just kept on being safe and careful. In July we were at a cookout at my aunt’s apartment, and were on a second-floor deck … which collapsed. Fortunately no one was seriously hurt, but we called hte OB and he told us to go to the hospital. The ER nurses were a bit dubious about the ‘deck collapsed’ story and questioned her separately. They did the non-stress test and checked on the baby – everything was fine. Lisa was put on bedrest towards the end as her ankles turned to ‘snausages’ as the doctor said, but everything stayed fine. At the end – no contractions, two weeks post due-date scheduled c-section – Lisa would sit and have ice cream and Mrs Richardson’s fudge sauce on her belly and we swore the baby didn’t want to come out and lose out on that goodness! But on October 2nd we were blessed with Daniel Patrick, the baby we really never accepted was coming until we held him in our arms. After Danny, the OB said ‘if you want more, start trying again after 6 months. Lo and behold, when we were on Cape Cod for a vacation when Danny was 8 months old (we’d moved up to renting cottages at that point) Lisa swore she was pregnant – and was! This was a much more difficult pregnancy – spotting, pains, and generally just a sense of not feeling well throughout. That followed into the c-section – Chris was breech, the c-section uncovered massive scar tissue Lisa had built that fused her internals together, and her system refused to restart for nearly two weeks (ilius). In addition, Chris turned blue (i.e. stopped breathing) twice and ended up in the NICU, where he was at least twice the size of the other kids! But after two weeks, we came home all together – and I call it a miracle, because there was one night where I wondered if I might go home alone! But there were no more miracles – our doctor warned us another pregnancy could be fatal, so I got surgery to make sure that did’t happen! But we are so lucky and happy to have the two beautiful boys we have! – We were staying at a Holiday Inn in Kissimmee, and the room had kids bunk beds and a bed for us, but no inside sitting area. Instead there were chairs and a table … outside the front door! It wasn’t a real ‘deck’, and we had the view of a parking area and a bungee jumping place, but each night we’d get a drink and sit and relax together. It was fabulous. Even in the early years of our marriage we noticed something – when faced with challenges like infertility and miscarriage, while we saw many around us crumbling and relationships ending, Lisa and I grew stronger. When Danny had pneumonia or had to get his kidney replumbed, we grew stronger; when Chris’ second grade teacher thought he had ADHD and wanted him medicated and the first doctor was only to happy to oblige, we worked hard in our belief, and ended finding out he had the opposite … and the problem was he was just plain bored and unchallenged in her class. Every step of the way, whenever there was an obstacle in our path we would join hands and cross that barrier, and would be stronger and better for having done so. If I had to pick the low-point in our marriage – and EVERY marriage has ups and downs – it would be the Fall I had to travel a week each month to Philadelphia for work for my Six Sigma training and project. The three weeks I was home were incredibly stressful as I tried to do a month of work in three weeks, and Lisa and the boys had a routine that pretty much didn’t require me, so I felt left out. My running had more or less stopped as I tried to get into work earlier to get home sooner, and our eating in general went to crap. We both gained weight, felt lousy physically, emotionally, and within the marriage – and we had a couple of external voices that seemed all too happy to inject problems between us. So what happened? We talked – and listened – to each other. My project ended. 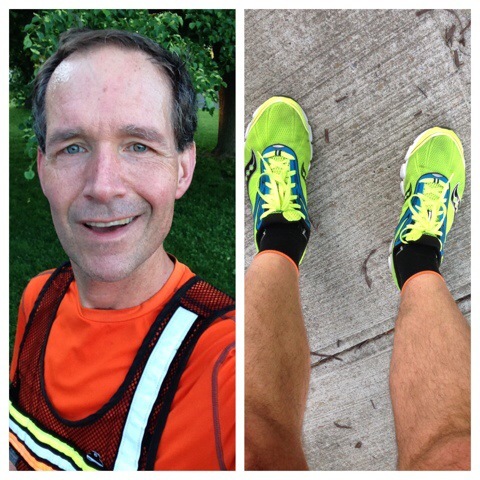 I started running again. We started eating better. And we realized how much we hated how things had been going. And while we have certainly fought more than a couple of time over the last 13 or so years since … we have never seen a low like THAT again. – The down-point was when Lisa was stuck in the house waiting for closing and we were having basement water issues, and I was in Corning for a month and my thyroid was dying fast and I had no energy – loads of stress that month! – Lisa noticed that moving here and working for Corning changed me – I became much more open and chatty. Maybe it was my thyroid medicine? Who knows – I am happy with the result. – The schools here are excellent, and the boys have had great opportunities – when I talk about things keeping us here, right now it is largely finishing high school for the kids. – There is so much great natural stuff to do – we have had great times hiking and biking and kayaking and so on throughout the Finger Lakes region. We went back to Massachusetts in 2008, but not again until 2012. But when we sat on the deck on Cape Cod in 2012, we started talking about buying a place like that to retire … but after going back this summer we know we could move there much sooner! I don’t know if or when it will happen … but I am enjoying dreaming about it together! – MADI – Mass Destination Imagination – creative problem solving group. The last year Lisa and I led the team to the state championship back in Worcester. It was an incredible experience. – Odyssey of the Mind – similar to DI, OM is another kid-centric creative problem-solving group that we led after moving out here to NY. – Nanoscience – while Lisa was working at the SDC, she was teaching a summer Nanotechnology program, and enlisted me to help out. The programs were her design, I was there as her helper, and we had an absolute blast with those kids – many of whom we still see in the schools. Something happened after the boys settled into high school: suddenly they didn’t need babysitting, and we could do things ourselves. And guess what? We HAVE! When the kids were little we hardly got out together – we had no real support, so we took to including the kids on all of the dinners out and so on. And we had loads of fun – but needed some alone time. Now that we can just go out – we have; from hikes to dinners to general fun times together, just sitting having a coffee or wine or water somewhere, walking around, shopping, or anything … whatever we do it is sure to be fun! Through all of the years we’ve been together, we’ve been lucky to discover that after all these years, we are STILL best friends! 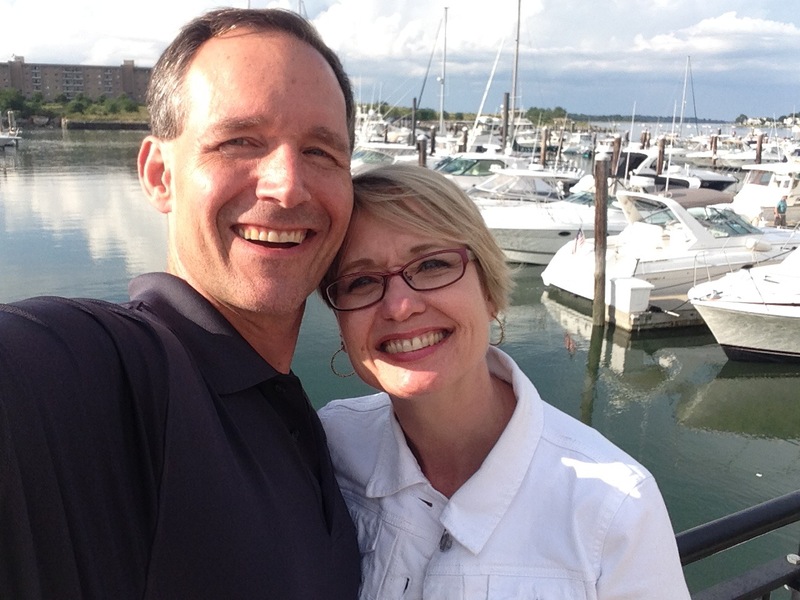 To Lisa – I love you more now than ever before, and look forward to all that life brings us in the future! 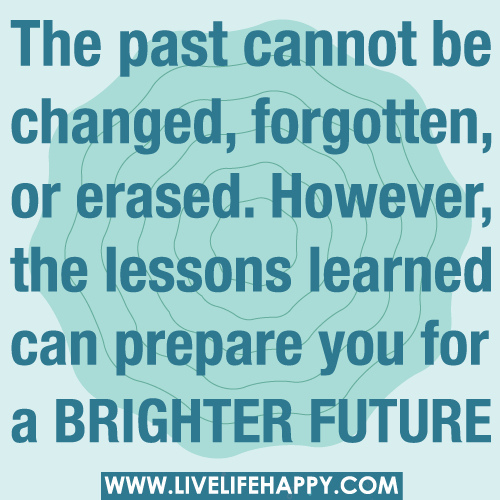 Take Care Thursday – Prepare Yourself Now for a Bright Future! I have no idea why, but it seems that since I started this blog I have been collecting lots of ‘Things I wish I could tell my 20/30/40 year old self’ posts, as well as ‘Things The Don’t Tell You About’, and ‘Things You Should Do Before’ articles and more. So I figured I would just steal fragments from a bunch of them and pile it all together into a set of a dozen or so general ways to set yourself up for a happier life! 1. For real happiness, focus on how your life feels instead of how it looks. It is easy when you are younger to see people who look happy and associate the outer trappings of what they have with the happiness they feel inside. But first, you don’t know if they are happy. And second, chances are it isn’t having a Mercedes or a nice watch or fountain pen that made them happy. Instead look at what drives you, where your passions are, and work on those things – that is how to be happy! As I have said, at 48 I am in the best shape of my life, and my body rewards me for taking care of it. We can’t control everything that happens in life, but give yourself the best chance to have a long life with the only body you will every have. But when making choices, remember they are YOUR choices. So if you choose to be Paleo or Vegan or Fruitarian or a junk-food junkie (good lord have pity on you), enjoy yourself … but remember you are not BETTER than others for your choices. 3. Don’t be afraid of your own voice. You are unique, special and important … and you only have one voice – so use it. I remember in college writing music for an electronic music class, and I had a thought in my head based on some works by others I had heard, but no matter what, it came out with a funked-up jazzy feel. I realized that was my musical voice, and no matter how I tried to compose a certain way it was coming through. The same is true with blogging, and even writing reports and presentations at work. Instead of trying to mold yourself after others, celebrate who you are. 4. Mortality is very inconvenient. It ruins a lot of weekends. As I said on Instagram the other day, there has been a load of recent information about the deaths and health issues of friends that has caused me to reflect. We are all going to die, and generally aren’t sent an calendar reminder of when it is coming. So we have to live in a way that makes our days worthwhile. 5. Marriage doesn’t complete you. Your validation comes not from another person or a legal institution … but from within. Celebrate the person you are – because YOU complete you. Once you realize that you are complete, you are better positioned to give yourself fully to your marriage or relationship. 6. What other people say and do has nothing to do with you. It is a reflection of them. This has come up many times, most recently from Carmy, but it is important to note – that when someone says something harsh or judgmental or spiteful or otherwise negative, it comes from their own place of negativity that has nothing to do with you. But internalizing these things it gives them more power over you. 7. Falling down is a mandatory aspect of life. Getting back up is living. We ALL fail … and pretty often, on anything from a very minor to very major basis. It WILL happen, even to people who don’t like to admit it. It is how you respond to these failures that informs on the type of person you are. One of my pet peeves (wow, I seem to have a lot lately) is people who refuse to acknowledge that they don’t know things. Look – we ALL don’t know things, and sometimes we don’t know stuff we SHOULD know, and maybe even learned at some point. Oh well – forgot. It is just fine – and with smartphones you don’t even have to run back to your office/dorm to grab the book containing what you forgot. 9. The only person holding you back is yourself. This came up with Michele’s post last week – and in posts both she and Hollie (and others)talked about the mental aspects of running. But it applies everywhere – once you have decided you cannot do something, it is done. If you decide you can it is no guarantee – but never underestimate the power of self-validation. 10. Everything in your life is a reflection of a choice you made. If you want a new outcome, make a different choice. Basically, if you do what you’ve always done, you’ll get what you’ve always gotten. This might seem counter-intuitive since common wisdom is to never enter a relationship with a ‘fix it up’ mentality, but the reality is that change will naturally occur as two people meld their lives together as one. But it is also important to maintain your identity and individuality in the relationship. 12. Consider the other side of the story. You are not the singular purveyor of TRUTH. Chances are your point of view is different than many other people … so listen, you might learn something. Also, be willing to learn. 13. The best advice is felt in your heart not directed from your head. Do you ever notice how certain things people said to you echo across the years, remain mantras and fuel your passions? These are not just words committed to memory, but feelings etched into your soul. 14. The sooner you can like yourself, the easier life will be. The old saying is you cannot be truly loved until you love yourself and realize that you are worth loving. SO get to it … because you are awesome just how you are. 15. Accumulating “stuff” is stupid. Over a certain amount, getting more money doesn’t add to your happiness. And when you get more money the first thing that happens is more spending – so your effective ‘wealth’ remains pretty constant. And what happens with ‘stuff’? Either it is something that will need replacing when the new version arrives next year, or you will end up not caring about it in a while. Regardless it is all just stuff – perhaps it allows you to momentarily show off to someone … but exactly what benefit is that? In any relationship, hiding things is the express route to failure. Communication is critical if you want to have a successful relationship. And it isn’t just the basic act of communication – you need to be open and honest with those you care about, and find a way of sharing your feelings and things that really matter. Make a prioritized list if you need help doing this – no one will judge you if they actually care. You know how many people can have 100 people in a room, and 99 say something nice and the other one says something critical … yet the voice they hear is that negative one? Yeah, WAY too many! Don’t rent out your mind-space to other people who you don’t care about, and don’t let them control your life. It just isn’t worth it! 18. Marriage isn’t hard if you like each other! This is a simplification as all relationships have ups and downs, but when you are operating from a place where the first instinct is teamwork and shared solutions … you’re already halfway there! No matter how busy you are with work and family and whatever else … remember to always find a few minutes each day that is only about you. Maybe it is on your run, maybe you sit in the car for 5 minutes before heading into work. Whatever it is, own it and make it your own. My ‘mostly unplugged’ weekends have been incredibly rewarding. They allow you to be truly ‘in the moment’, and by allowing yourself SOME amount of connection you free yourself from that being a huge concern. 22. People will steal everything you do. This is ironic because all of these points come from a dozen or so different posts I have been collecting in drafts for the last year! But don’t be so possessive of your ideas that you don’t share freely – because then you lose the joy, and will eventually lose exclusivity to the idea anyway. What thoughts do YOU have for a brighter future? As we are away again, I am once again dipping back into the archives – this time to our 13th wedding anniversary! For those counting, that makes this from 2005! At the time the boys were 7 and 9 years old. I have really appreciated the responses on my ‘from the archives’ posts as well as the one about smoking … so I am going to pluck another one from the depths of the archives of an older blog written for myself. When you read this we will be on the road at the crack of dawn coming home from another round of college tours! Just a note – I have been loving the amazing posts and comments from everyone these last couple of days. One thing I really loved was the reaction to my supplement post – it was meant to be provocative and many of you chimed in somewhat disagreeing but also being very respectful. It was awesome! I can’t wait to fully catch up on everything! My wife and I got the rare opportunity to go out to dinner together without worrying about the babysitter. Last week* was our 13th Anniversary, and on our anniversary day we went with the kids out to Deerfield (MA) to a place called ‘George’s Rocks’ which had a nice litte Dinosaur exhibit and a man-made ‘mine’ for kids to get a bunch of polished rocks. It was fun for an hour or so. We also went to the Yankee Candle Factory store, which is always fun – they make it such a pleasure just to explore that the shopping part is secondary. Then we went to a nice little Italian place (Monty’s Garden in Leominster) for dinner – one of those places that was good as a family, but not so much of a ‘me & the wife’ things. Last week we also had one of Lisa’s good friends from college and Christopher’s godmother up from Wed – Sun. She offered to stay with the kids while we went out Saturday. Whew! Normally we have to deal with the babysitter (she is very good, but only 13 so we are careful about time) or my parents (…). 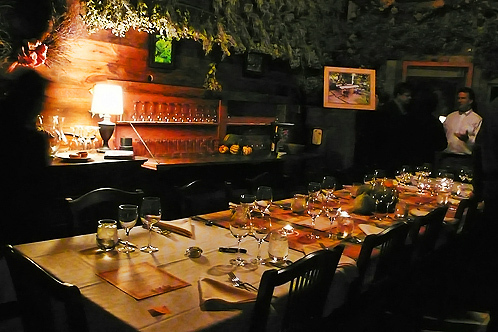 We went to a very highly regarded place called the Herb Lyceum, which was a herb garden that has evolved into a fine dining place. No liquor license, bring your own wine. They have a single fixed menu for the month. All that was fine, but seating was ‘communal’ – meaning that there were two tables for 10 and one for 15, making their 35 person capacity. We tend to like more intimate dinners, but thought we’d try. Our thoughts were ‘not bad, never again’ – see, we had no real together time. Intimate side-talk during a dinner party is rude. Also, you don’t know anyone, and there were two very nice couples we sat with and had some nice discussion. Then there was a ‘younger’ couple, early 30’s. They never relaxed and weren’t much fun to talk to because of it. Finally there was a very pretentious couple, who would throw out names and places, but when anyone would want to discuss them, would seem bored and detached. Not much fun. But at least we got to dress up, have *awesome* food and wine, and a little time away. So what did we learn? While we both enjoy the company of others, what we relish most is intimate time alone to celebrate our life together. In an age of 50% divorce rates – some of which have hit awfully close to home recently – I revel in the love and friendship I share with my wonderful wife. So even though we didn’t have the greatest time at this ‘dinner party’ style night out, we did it together, and shared in that experience and learned something about ourselves as individuals and as a couple. It was funny reading this for the first time in 9 years. Back then we were JUST getting a reliable babysitter, but still wouldn’t do anything major or outside of our town – we were happy just to get some rare alone time! In fact, we had gotten into the habit of doing most holiday dinners as a family – including Valentine’s day … so this was a real rarity. Now that the kids are older and we are getting much more time together … we still revel in our time alone together and I don’t think our thoughts and feelings would be any difference. Another thought – I thought I knew what I meant by divorces ‘hit awfully close to home recently’ … but then I realized that neither of my siblings (both of who are divorced now) were even separated at the time. Have you eaten in a fine dining place with communal seating? If so what did you think? If you have kids – or other reasons why time with your significant other is rare, what does your date night situation look like?